Gram could have actually used "cremation planning" services. This is one of those times when my dueling interests collide. 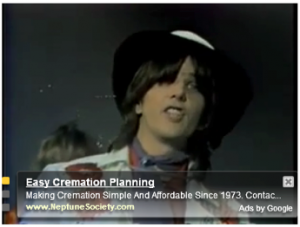 While watching a video of Gram Parsons a text ad for cremation services scrolled across the screen. Now, knowing a thing or two about how YouTube’s ad service attempts to match banners to content and known user behavior, this is more than just a creepy coincidence. I mean, what kind of algorithm put these elements together? Or what are Gram Parson’s fans clicking through after watching his videos? For those who may not know, Gram Parsons had asked to be put to rest in Joshua Tree National Park. When he died at the age of 26, friends kept their promise and “stole” his body from LAX and eventually burned it in the desert. Due to a lack of clarity in the law at the time nobody was charged with a crime and the story now lives in the annals of rock and roll legend. But how unsettling is this ad matching? What’s next, carpet cleaner over a Kurt Cobain tribute?